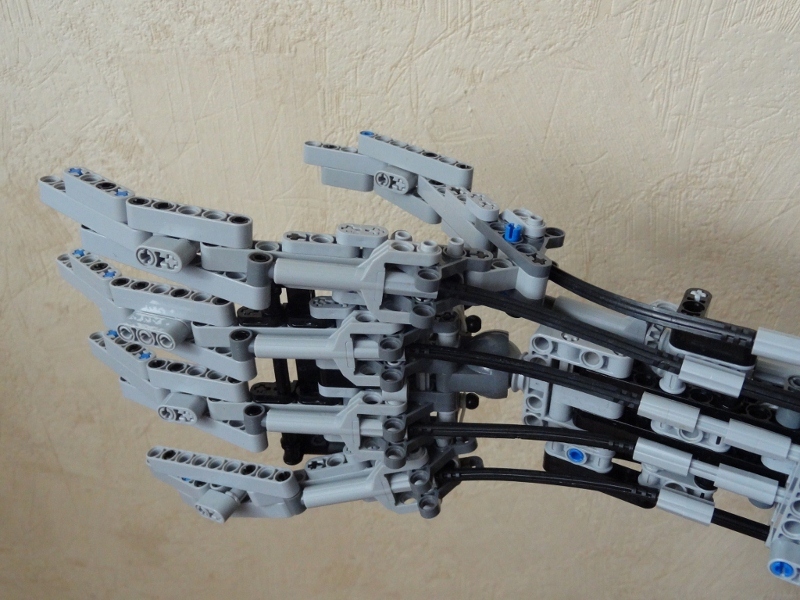 From time to time we get to see a new attempt for a prosthetic hand, arm or both, made with LEGO Technic parts, by some addict fan. Fortunately all these attempts are very different from each other, and pointing to different solutions and directions. Some are fully based on pneumatics, others fully geared or even robotized with LEGO MINDSTORMS, but all very ingenious [1, 2, 3, 4, 5]. This week Peter (piotrek839), a LUGPol member, showed on EB his proposal - a 1:1 scale, fully motorized prosthetic hand, wrist, arm and elbow, with 12 PF motors. You can find a load of additional photos from this project at Peter's respective folder on Brickshelf. There you'll see many of the technical solutions he used and the prior studies still in CAD renders. One of the solutions I most liked was the sliding axles with consecutive gears to implement a kind of extensible axles, and the use of soft axles to transmit rotation to the mLAs at each finger, as they adopt variable positions. This solution must somehow limit the usable torque, but still within the required range.